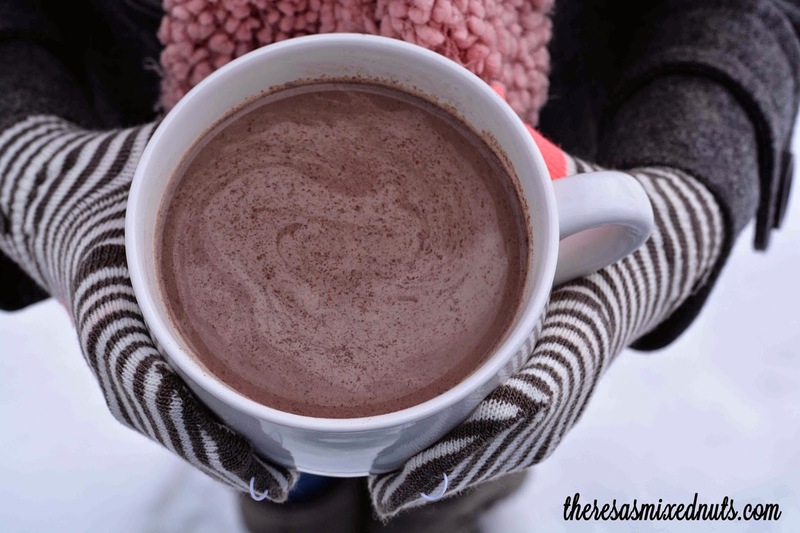 Theresa's Mixed Nuts: Cocoa For Chocolate Lovers On A Cold Winter Day! 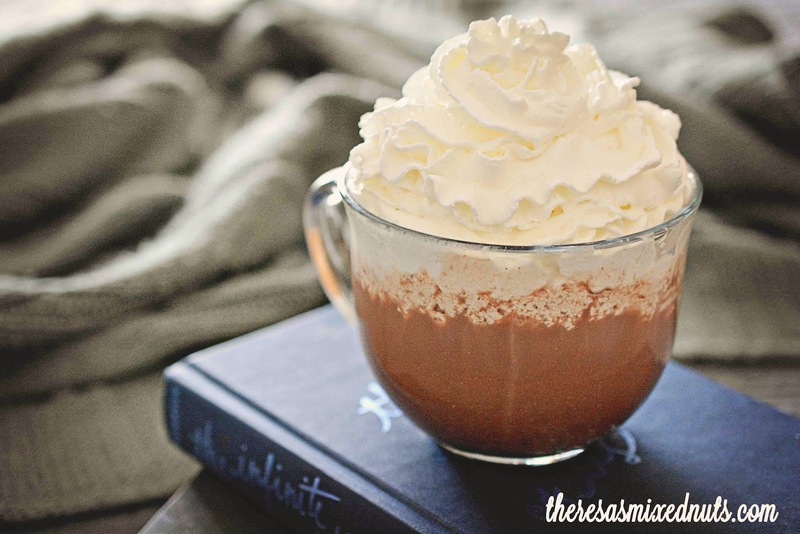 Cocoa For Chocolate Lovers On A Cold Winter Day! My gosh, it is COLD! I have been freezing out of my ever-loving mind all week! The kids only had school twice last week due to the freezing temperatures. We have been busy chugging away at our basement remodel, but I have decided that this weekend I am going to stay under the covers, curl up with a few good books, and sip on some rich chocolatey hot cocoa. I remember my mom making huge batches of homemade hot cocoa when I was a kid, and it was so scrumptious! Nothing beats the flavor of a good pot of homemade hot cocoa! I was intrigued when I saw this Cocoa For Chocolate Lovers recipe on Golden Blossom Honey. It called for an addition of cinnamon, which I have never had in my cocoa, and I was curious how well it was going to taste mixed into the drink. It turns out, I loved it! The cinnamon adds an overall warmth to the flavor, leaving me wondering why I haven't tried cinnamon in cocoa before. My girls love to have a glass of cocoa to warm up after spending time playing out in the snow. I hope they have such fond memories of mama's homemade hot cocoa that I serve them, thanks to the delicious recipe I got from Golden Blossom Honey! What are your weekend plans? Does it include a steaming cup of hot cocoa? You do make the most awesome looking/sounding things with that honey!! My mom used to make homemade cocoa too, and I forgot all about it until now! I really enjoy cocoa. I think I'll pick up some Golden Blossom Honey this weekend. I bet the cinnamon is good. Thanks, Theresa - get warm. I've tried cinnamon, nutmeg and vanilla in my cocoa but never honey. I bet it's good. I'm not a whipped topping girl. Marshmallows are ok but not whipped cream. Looks pretty though. I need to try the nutmeg. I bet that's a great spice to put in there! They cancel it because of the kids that have to stand outside and wait for the buses. The bus is so unpredictable whether it's going to show up on time or not, and they don't want the kids getting frostbite. I drive mine in every morning, so it's not a concern of ours. They never cancelled it when I was a kid either, and I remember thinking I was going to die waiting for the bus on those freezing mornings! There is NOTHING like a mug of hot chocolate on a cold winter day. Especially after you come in from shoveling snow. I have been using almond milk and it just doesn't taste like real hot cocoa when I make it. You made me want a cup though, so I am going to try your recipe using my almond milk. Really? I love almond milk in my cocoa. Maybe I'm just used to it by now though. A mug of hot cocoa sure does sound good on a cold day like today! That cup looks delicious! That is the yummiest sounding drink ever. I think this will be made in our house in the near future. Its pretty cold here. That looks delicious! I've never tried honey in cocoa before. I can't wait to try it! There is nothing like a cup of hot cocoa to warm you up on a cold winter's day. Yes I have had cinnamon in my hot cocoa-it is delicious. What I have not added is honey-gotta try that!! Hi! I love your recipe and this is very good honey! Nothing better than having hot chocolate on a very cold day! I could drink it every day! My husband loves honey on/in everything he eats. And I love hot chocolate. I just hope that this weekend warms up so we don't need so much hot chocolate! This looks so good! I may have to have some hot coco this evening. Even though I'm focused on the chocolate, those gloves are adorable. Drats, I was hoping to distract you long enough to take a sip. Didn't work. Guess I'll have to make some myself. Thanks for the recipe. Gosh, I love cocoa, I thought I was to only one that made it with honey! apparently not. Hold the cinnamon though, bleh! Oh this just looks absolutely delicious. There's nothing like a hot cup of cocoa on a cold day and with the weather we've been having lately, I need to get a good cup along with that honey of course. We always keep honey on hand. Yummmmm.... Cocoa. It snowed here today, and I think I am going to have to make myself some! That picture on the top of this post with all the whipped cream..... perfection! That cocoa looks amazing! I am going to have to try this! That sounds and looks amazing. I bet the honey adds a really nice flavor. I have never added honey to my cocoa before. I am going to try that it sounds delicious and perfect for this time of year. That looks so good. Perfect for this time of year. Oh, that looks so yummy! We are having an extremely cold week with lots of below zero temps, so this would be wonderful right now! This looks and sounds delicious. There are few things better than a cup of hot cocoa on a snowy day. I love adding cinnamon to my hot chocolate. It adds such a wonderful taste. I have never thought to add honey but definitely will try it! Yummm this looks delicious. We love honey in our hot chocolate- heck we love honey in just abut everything. Hot chocolate is heaven. Especially during the winter I just can't get enough. This looks sooo good! I never would have thought of putting honey in hot chocolate. This looks so yummy. I make homemade hot chocolate but I have never made it with honey. Now I am going to have to try that out. It's snowing here in Ohio right now and this would be perfect! I've never added honey to my cocoa but I've added it to my coffee and it's pretty good! We just moved to Florida and I thought I would never *need* hot cocoa again but it turns out I was just dreaming because it would have been perfect this weekend. I neeeed that...looks so yummy..thanks for the recipe.. I will be honest I never thought to mix honey with hot cocoa! That pretty different!